I’ve been thinking a lot lately about the relation between nature and grace – a relation which is of fundamental significance for the whole structure of dogmatic theology. 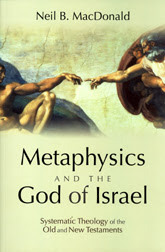 And Neil MacDonald’s book, Metaphysics and the God of Israel, is a remarkably creative and provocative attempt to rethink this relation – indeed, to rethink metaphysics as a whole – from the standpoint of divine self-determination. MacDonald’s central thesis is simple enough: the mode of all divine action is self-determination. God acts by determining himself to be the one who acts. In other words, God acts by directing his own identity, by acting on his own being. According to MacDonald, all divine action can be understood along these lines. God is creator, for example, simply because he determines himself to be the world’s creator. This determination is strictly something God does to himself. The book’s most insightful – and most challenging – thesis arises at this point: if God had not determined himself to be this world’s creator, the world would nevertheless be exactly the same, except that it would not be identified as God’s creature. “We are not saying this world … would be a different world in terms of its natural properties, were it not created by God,” MacDonald insists; indeed, “there could well have been … a world identical to the one we inhabit that was not created by God” (p. 34). If we ask, then, how the predicate “created by God” can be true of the world “without it being the case that anything is said or implied about the natural or material properties of the world,” MacDonald replies that the predicate “created by God” simply describes something God does to himself. It “does not imply anything at all” about the nature of the world (p. 35). This line of argument is, of course, an extremely radical reassertion of Barth’s critique of natural theology. Here, there is no inherent connection between creator and creature, nature and grace. The only point of contact lies in God’s own self-determining act – an act which is itself the wholly contingent, wholly unnecessary relation between God and world. This understanding of creation, MacDonald notes, “minimizes the importance of any … interaction between theology and science,” since “one could have two identical worlds one of which it would be true to say that God determined himself to be the creator of it and the other not” (p. 40). In a nutshell, what this means is: no natural theology! MacDonald also argues that his concept of self-determination can lay the basis for a new “biblical metaphysics” which can account for the way God acts in relation to the world. Just as God becomes the world’s creator through an act of self-determination, so God “gets himself into the world” by determining himself to be in a personal space-time relationship with his creature (p. 67). Against the classical conception of God as acting providentially in history “from eternity,” MacDonald insists that God has a place in the world, and that God acts from within the world’s history. God determines himself to be part of his creation, to remain in our time after the act of creation (this, MacDonald says, is the meaning of the seventh day of creation in Gen. 2:2-3). God therefore “has time,” he “has a history.” In contrast to a classical metaphysical construction in which God eternally determines what will happen in time, MacDonald thus argues that God simply “determines himself to be within our time,” so that God “comes along with us” in personal relationship (p. 79). Further, God determines himself to be infinitely temporal and infinitely spatial, so that he has a time and place within the world which is nevertheless “peculiar and exclusive to him … as one of the divine perfections” (p. 86). And if we want to understand the nature of this peculiar divine (ad intra!) space, we must point to the resurrection: “to say Jesus has been raised is to say that he is in God’s space, the space peculiar and exclusive to God” (p. 89). On this basis, MacDonald also sketches a christological reformulation, according to which “human history [is] ... present to God ad intra,” so that (following Richard Bauckham) the human identity of Jesus is the divine identity (p. 239). This whole book bristles with vigorous insights, surprising possibilities, and explosive ideas (for just one remarkable example, see the penetrating interpretation of das Nichtige, in a footnote on p. 217) – and each stage of the argument is developed through skirmishes into Old Testament exegesis, historical theology, modern philosophy, and Barthian dogmatics. In the end, however, I must admit I found the book a little disappointing and a little unconvincing. The problem, I think, is that MacDonald’s concept of self-determination remains too narrowly formalistic and analytical, so that one is left with the feeling that this concept just doesn’t do very much after all. MacDonald has a lot to say about logic and rationality, and he suggests that the “litmus test” for his thesis is whether it is “logically consistent” (p. 133). But logical consistency is hardly an adequate litmus test for a theological proposal of this scope. When the problem of God’s spatiality is raised, for example – in what sense can God said to be spatial if his location cannot be defined by geometrical description? – MacDonald merely assures us: “it is enough that ‘God determines himself to be in a place in this world’ … is a logically consistent claim” (p. 117). But this is clearly not enough – not by half – since there’s all the difference in the world between the (minimal) formal requirement of logical consistency and the material requirement of a convincing explanation. Concepts in dogmatic theology ought to have real explanatory power; even if they can’t clear up every problem, they should certainly “prove themselves” by reaching explanatorily beyond the safe circle of tautology (after all, any tautology is logically invincible – but that doesn’t mean it explains very much!). It seems to me that MacDonald could thus refine his proposal, not by altering its fundamental thesis – that the mode of divine action is self-determination – but by allowing the formal questions of “rationality” and “logical consistency” to recede into the background, and by concentrating explicitly on the development of a more expansive, more differentiated, and more discursive account of self-determination. Of course, Karl Barth’s doctrine of election is itself precisely such an attempt to develop an expansive christological conception of divine being as self-determining being – and Barth’s own ontological construction (cf. also the interpretive work of Robert Jenson and Bruce McCormack) clearly indicates that the concept of self-determination need not be reduced to tautology, but can exercise extraordinary explanatory power which makes itself felt in every corner of the dogmatic loci. I voice these criticisms, then, as a friend and ally of MacDonald’s proposal. I think a new ontological vision of divine action as divine self-determination is precisely the way forwards for contemporary dogmatics; and I believe one of the resources for this ontological thinking is a radical recovery of Barth’s critique of natural theology (as a corollary of Barth’s christological actualism). So I think MacDonald’s proposal is of tremendous value, even if the concept of self-determination needs to be developed in a much more refined and more expansive way than it is here. One final note: in my opinion, MacDonald’s radical critique of natural theology – “the world would be the same even if God didn’t create it!” – is a stunning intervention in contemporary theology (where, in most quarters, “creation” has become an axiom which wholly determines the structure of christology, reconciliation, eschatology, etc). Nevertheless, I don’t think I agree with MacDonald’s suggestion that this stance eliminates the significance of dialogue with the natural sciences. On the contrary, dialogue with science may play a crucial role in interpreting the “site” or “situation” (to borrow Badiou’s terminology) in which the event of God’s self-determining action takes place. If God interrupts the natural order in a new event of self-relation to the world (thus constituting the world as “creature”), then it is of great significance to understand what kind of world this is which God interrupts and reconfigures. For example: the core event on which theology reflects is the resurrection of Jesus; and although this event is unthinkable for natural science, the site of this event (i.e. a dead human body) is an object of scientific knowledge, and it is precisely this site which the resurrection interrupts and reconfigures (i.e. without this corpse, there could be no resurrection). In other words, although there is no direct trajectory from scientific knowledge to a knowledge of divine action, science may nevertheless help us to understand the situation in which the divine action takes place, and the kind of reconfiguring which this action produces. And if this is the case, might it also be possible that a profoundly atheistic interpretation of the natural world is in fact more useful for theological reflection than any explicitly religious reading of nature?